Mr Harish Bhandari is a Consultant Gynaecologist and an accredited sub-specialist in Reproductive Medicine and Surgery. He is a full-time NHS Consultant at Leeds Teaching Hospitals NHS Trust and holds an Honorary Senior Lecturer post at the University of Leeds. Mr Bhandari offers a complete service to couples with fertility problems. At and is an expert in all methods of assisted conception including in-vitro fertilization (IVF), intra-cytoplasmic sperm injection (ICSI), in-utero insemination (IUI), ovulation induction (OI), egg donation and fertility preservation. (Please note Nuffield Leeds offer fertility-related consultations but not assisted conception). He is a confident laparoscopic and hysteroscopic surgeon and specialises in the surgical management of gynaecological conditions affecting fertility such as endometriosis, ovarian cysts, fibroids, tubal disease, endometrial polyps, pelvic and intra-uterine adhesions and uterine septum. He has considerable experience in the management of menstrual disorders including heavy menstrual bleeding, painful periods and pelvic pain. Apart from assisted conception and reproductive and benign gynaecology surgery, he has special clinical and research interests in recurrent miscarriage, recurrent failed IVF treatments and endometrial immunology. He is a founder-member of Endometrial Research Group in Leeds which has been set up to research the role of the endometrium (lining of the womb) in women with fertility problems. In addition to clinical practice and research interests, he has extensive teaching, training and service development commitments. Mr Bhandari is an Associate Editor of International Federation of Fertility Society’s journal ‘Global Reproductive Health’ and has authored many peer-reviewed publications and book chapters. He is a member of National Casemix Office Expert Working Group. He recently relinquished his post as an elected Junior Clinician Member of the British Fertility Society Executive Committee and the BFS Training Sub-committee. Besides spending time with his family in his free time, he keeps himself fit with various indoor and outdoor pursuits. He enjoys watching cricket and cooking Indian food. In quieter moments he enjoys listening to Indian music. Mr Harish Bhandari was awarded Doctor of Medicine (MD) degree by the University of Warwick for his research work defining endometrium (lining of the womb) in obese women and for investigating if obese environment causes perturbations in the endometrium around the time of embryo implantation. His work has provided evidence to suggest that the poor reproductive outcome in obese women has a molecular basis that lies in the endometrium. 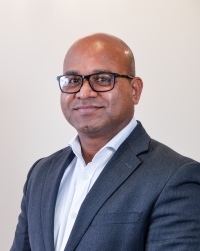 Mr Bhandari is a founder-member of Endometrial Research Group in Leeds which has been set up to research the role of endometrium in women with fertility problems. Mr Harish Bhandari does not hold a share or financial interest in this hospital, another Nuffield Health hospital or the company. Mr Harish Bhandari does not have a share or financial interest in equipment used at this hospital or another Nuffield Health hospital. Mr Harish Bhandari does not hold any paid advisory role(s) at this hospital or on behalf of Nuffield Health.